The CMI-1 allows the user to add a full featured microphone to your remote setup using a laptop or a cell phone. This accessory really puts the icing on the cake. Better audio quality than any phone headset by far. 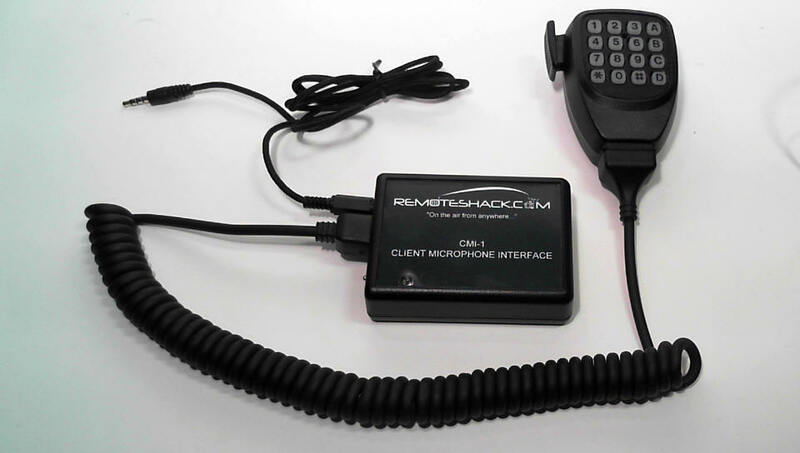 This mic has been modified for cellular calls and also digital calls such as Skype, MagicJack, and Vonage. Full bodied, yet crisp response. Noise cancelling. Car windows open? Not a problem. Backlit. Guaranteed great sound. Click the picture above to see the video. Plug and Play into your cellphone or laptop (9V battery required). Some of the older rigs from the 80s and 90's and all ICOM radios do not support turning them on or off remotely. So if you want to shut the radio off while you are away, then the RBC-120REL will do the job. 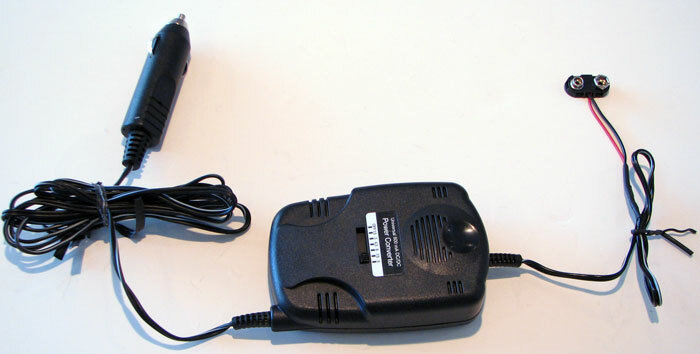 Simply connect the RBC-120REL to the RemoteShack with the supplied interconnecting cable(not shown)and then plug the outlets in series with your radio or power supply(or any other 120 volt device) and it will switch your device/radio on for you automatically when you log into the RemoteShack. Shuts off automatically when you log off or get disconnected, or you can choose to turn it on or off manually via DTMF when you are logged into the RemoteShack. This unit allows the user to switch on or off 15 amps @ 120 volts. This unit comes Plug and Play, assembled with all necessary cables and instructions on how to connect and configure the RemoteShack. Rigs that already have software capability to turn them on or off include: All Kenwood HF rigs, new Yaesu rigs like the FT-950, FT-2000 and newer. If you can turn your rig on and off in Ham Radio Deluxe, then the Remoteshack can do the same. The RemoteShack needs to connect to your radios serial port. 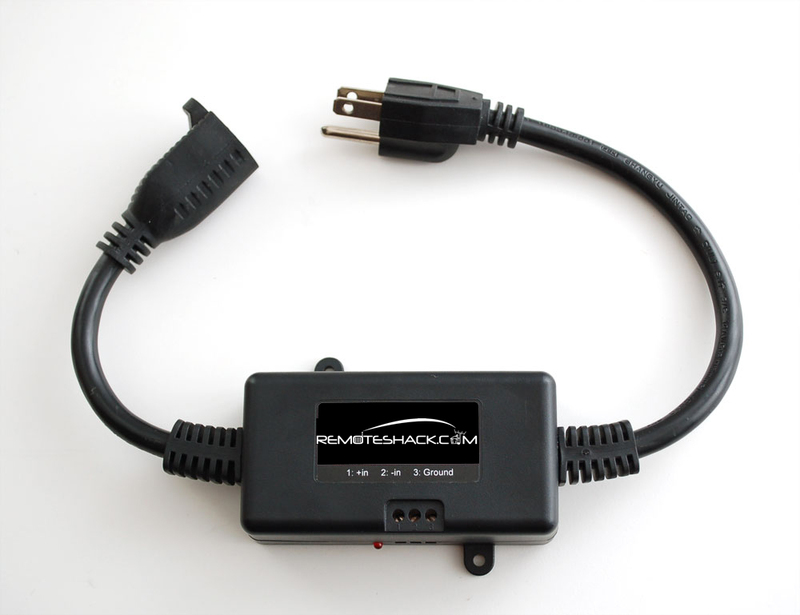 If you have a serial controlled rotor controller, then you will want to connect the RemoteShack to that controller as well. But what if you also have these ports on these devices connected to your computer or other device at the moment? The RBC-PSS will keep the existing connections on your other devices when you are not using the RemoteShack. When you log into the RemoteShack, the RemoteShack will send a command to the RBC-PSS to switch the port over automatically. So all devices can be shared when needed. Neat! This unit also provides "Y" cable serial splitting required for some amplifiers and tuners that need a serial port connected to them at all times so they can tune when the frequency is changed by either device connected to the RBC-PSS. Comes Plug and Play for most configurations. Contact us for your particular amplifier/tuner/radio configuration if you have questions. This unit provides 8 different relays under DTMF control from MENU #6 on the RemoteShack. Just wire the relays up to anything you can think of up to 5 amps each. Unit is Plug and Play. Just plug the supplied power supply into the wall and plug the control cable into the RemoteShacks' AUX port. You can configure the relays for momentary or latched, you can also configure the unit to automatically switch a relay on after you log in and/or out. Comes with 12V power supply and an RF remote control to switch the relays on or off manually in the shack or around the house. Both units have screw holes so they can be mounted to a wall if desired. 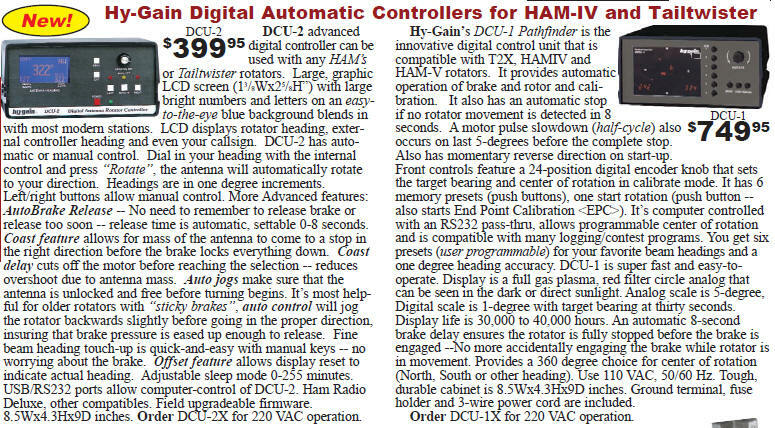 Also connects directly to the RBC-9REL for 120 volt relay control, see below. This RBC-9REL power strip has a DB-9 control port (line in) that can connect directly to any or all of the relays on the RBC-8REL. This effectively gives you control of up to 8 120 volt devices. You can connect only the number of 120 volt outlets you need to the RBC-8REL (so you can mix and match with the RBC-8REL and RBC-9REL). Each outlet is rated for 5 amps with a max of 15 amps total for the strip. 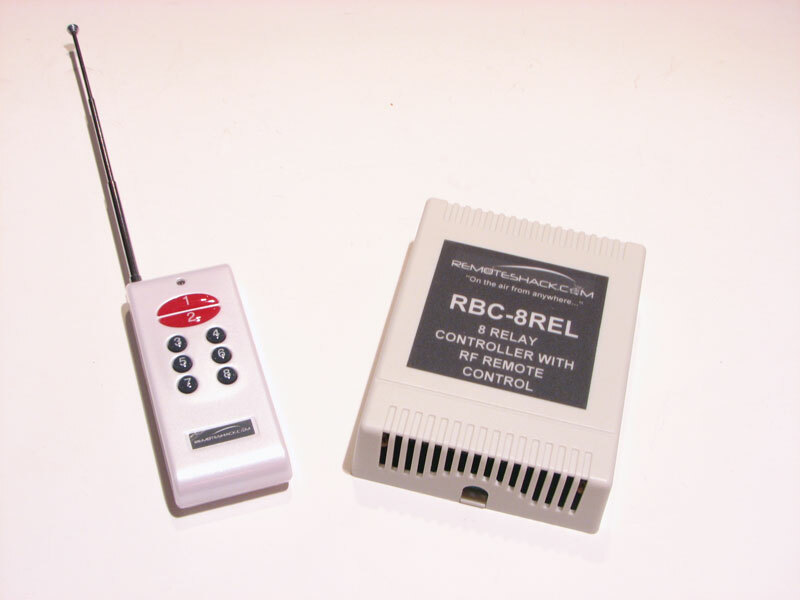 This unit also has a DB-9 control port output (Line out) for the RBC-10REL(see below). Comes with a fly-wire DB-9 cable and the strip has two holes on the ends to mount it. The RBC-10REL allows you to monitor the switch levels of the RBC-8REL by lighting up each switch light. 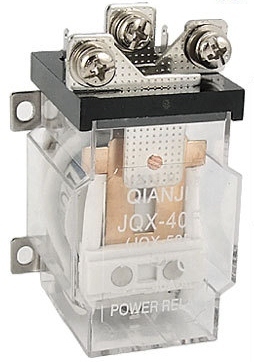 It also provides you a local switch to override the RBC-8REL as well as another momentary switch below each channel switch to "flash" the outlet. It is 19" rack mount or it is heavy enough to just add rubber feet and place it on a shelf in your shack. Comes with a DB9 cable to plug directly into the RBC-9REL "line out" control. Plug and Play. The CMI Laptop Interface Cable allows you to connect the CMI-1 to your laptop. This cable plugs into the mic and speaker jacks on your computer and the other end plugs into the cable coming from the CMI-1 shown above. A DC to DC converter is a must have for mobile vehicle operations with the CMI. This unit takes the first hit from transients in a vehicle electrical systems from jump starting, alternator still turning after shut off, and other forms of noise. Plug and Play for mobile use, or just cut off the cigar plug and connect directly to the fuse box and tie wrap the unit under the dash for permanent installation. 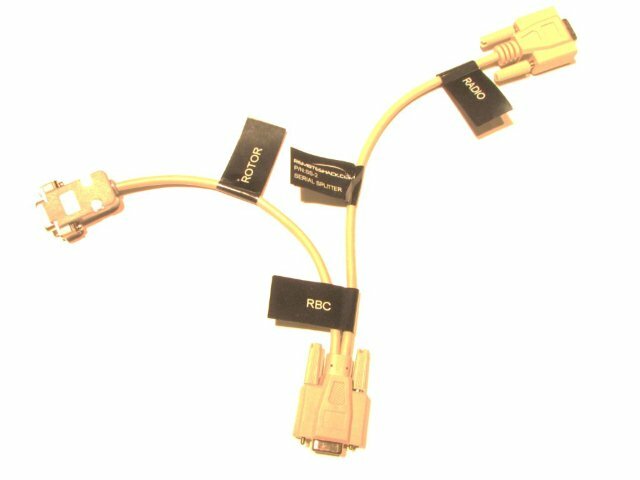 This cable splits off the serial port of the RBC-212 into 2 ports. One to control the radio and one to control any DCU-1 rotor with a serial port. If you do not have a serial port on your rotor, click here to check out the interface card from Idium Press to add an RS-232 port to your control box. Most of the older radios and all ICOM radios do not have the capability of turning on or off remotely. This relay kit allows the user to switch on or off 40 amps @ 12 volts. Simply wire this relay in series with your red +12V connection of your radio. When you log onto the RemoteShack, it will turn on. 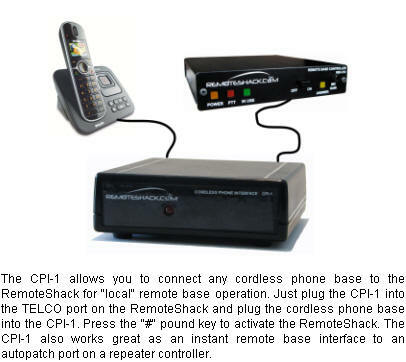 When you hang up(or if the RemoteShack hangs up on its own), it will shut off. This relay can be configured for automatic operation as just described, or you can configure a jumper on the RemoteShack that will allow you to manually turn this relay on or off in Menu #2, keys 7 & 8. This kit comes assembled with all necessary cables, instructions, terminal crimp/solder connectors (for series connection to the relays terminals)and power supply to power this relay for direct connection to the RemoteShack. All you will need to do is wire the 2 series connections of 12V DC and plug it into the AUX port on the RemoteShack. Compatible Rotator Controllers By .